Maybe you have heard of it. The new way to workout that is sweeping the world. CrossFit is a core strength and conditioning program that encourages a broad and inclusive fitness adaptation. To accomplish this CrossFit uses constantly varied, functional moment at high intensity. This broad and inclusive fitness program uses elements of weightlifting, gymnastics, calisthenics, and mono-structural activities such as rowing and running. Workouts are typically short, most ranging between 10-15 minutes, some longer some shorter, where all energy systems are targeted and both organic as well as neurological physical skills are developed. CrossFit is typically done in a group setting with a qualified coach leading participants through a fun and challenging hour long class, culminating with the WOD (Workout of the Day) at the end. CrossFit is relatively new and the sport is evolving very quickly. One of the biggest evolutions we have seen is the birth of the CrossFit Games. The CrossFit Games can be thought of as the world championships of CrossFit. It is a quest to find the fittest person on the planet. The first step everyone must go through is The CrossFit Open. The CrossFit Open is open to everyone. Every week for five weeks a workout is released by the CrossFit Games director, Dave Castro and participants have a few days to give it their best and tackle what usually proves to be a gruelling test of not only your physical, but also your mental toughness capabilities. What’s great is that the CrossFit Open is for all levels, including beginners. Week to week you can choose between the Rx or scaled (lighter weights and possible movement modifications) version of the workout. Then, you and other members of the box (what CrossFit gyms are called) get together, throw down, and get at it as hard as they can! It’s quite the challenge and not for the faint of heart..but it’s so awesome and such a great opportunity of personal growth. Here at Weerfit there were three of us this year that took on the challenge of The Open; Job, Tjade, and yours truly. I love the Open! I have been competitive all my life and The Open gives me a great opportunity to get my “competition fix”. We all had our different reasons for competing this year. Job decided to do every workout scaled and push himself to the outer edges of what his energy systems were capable of doing. 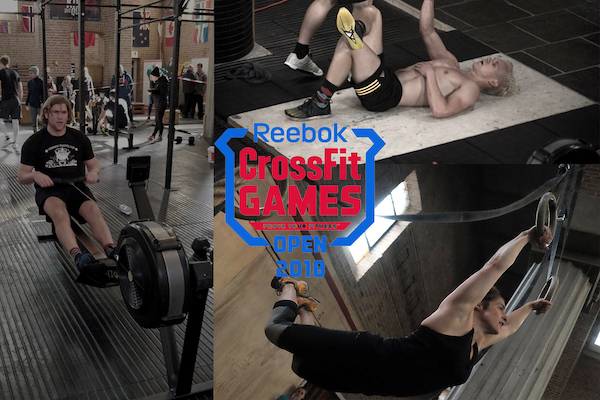 Tjade is an up and coming talent in CrossFit and this year’s Open gave him a chance to see where his newly developed high level skill set would take him, despite having to battle the effects of a week of apres ski during the Open! This was my 6th Open and amazingly enough, as I approach my 40th birthday, I might even be getting fitter. Every year there is a repeat of a workout from a previous year. This year saw a Goldie Oldie from 2012. My older, wiser, more refined self beat my younger self by 24 repetitions (a landslide in CrossFit terms). Another highlight for me this year was achieving a personal record (PR) in another one of the workouts where you were asked to perform a one rep max clean. I ended up cleaning 87kgs! Not bad for an old gal! One thing I know for sure, performing these functional moments (squatting, deadlifting, pressing etc.) regularly has enabled me to stay moving and stay fit despite having major restrictions in my knee as a result of years and years of high level basketball. As we get older we tend to slow down and stop “playing”. It is during this “play” time that we see young people performing constantly varied functional movement at high intensity. Who says we can’t continue to play? The old saying rings true…”If you don’t use it, you will lose it”. CrossFit enables me to continue to play in a safe and fun way. Essentially, I am utilizing constantly varied functional movement at high intensity to not only preserve and optimize joint function but to improve common markers of health as well, such as decreased blood pressure, decreased body fat percentage, increased bone density and muscle mass, etc. Ultimately, this with CrossFit’s diet recommendations of eating vegetables, meat and fish, nuts and seeds, some fruit, little starch, and no sugar, is setting me up for a long, active, and happy life where I can continue to play… and If I’m lucky, I’ll still be crushing those PR’s and competing with the young bucks way into the future.